It's time for Trish to take the stage like she deserves. Her first battle being against INFAMOUS L.A.R.G.E., a stand that already took out 3 members of the crew and can't be defeated by killing the user, what a tough situation. 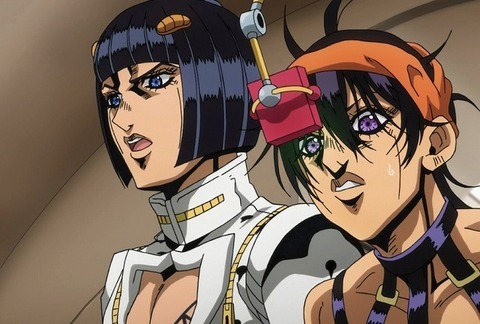 Abacchio just knowing how to pilot with his stand and movie knowledge, so Araki even Narancia thinks it's ridiculous. That's true, the thing is that there are certainly some really important differences in taking off and landing from different airports. Another thing is that there's a good chance given the events that happened, air traffic control is calling the police. I get the feeling landing won't be something they have to worry about with the way this fight is going. I don’t know if it was the fluid animation, but Trish looked a lot more beautiful in this episode. Where did that name come from? Crunchyroll calls it "Notorious Chase", and it's officially called "Notorious B.I.G. ", so where does Infamous L.A.R.G.E. come from? 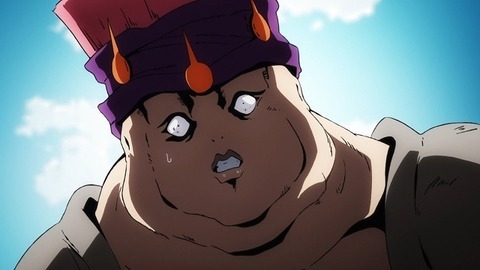 Not sure if this is a legit question, but prior to this episode, fans have always guessed how they're going to rename Notorious B.I.G., the same for other Stands. I kinda hoped it's Scandalous T.H.I.C.C. Gotta hand it to Giorno (he), for a guy whose hand has just been ripped by bullets he seems totally calm and composed, id be rolling on the floor screaming and crying my eyes out like a baby. 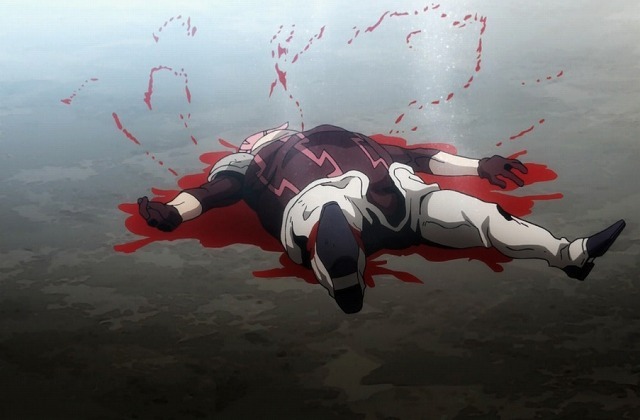 Carne always was a pretty underrated villain, fucker was willing to die for the boss in order to activate his stand, so badass. Interesting thought ! In that case maybe Notorious B.I.G. works like a parasite, and had been slowly eating Carne from the inside or just his Spirit, which could explain why he was so eager to die. Makes me wonder...How does Carne and the boss even know about Notorious B.I.G. 's true powers, if it can only be activated once he's dead? And how does Carne live through each day thinking that the only time he will be useful is when he is dead? I figure he was probably in the same situation as that capo who committed suicide (not Polpo, the older one). He got to live the good life but knew that one day the jig was going to be up. He could also have guaranteed his family's life in some way thanks to his sacrifice or something like that. "Once we get on a plane no stand can follow us"
If only they knew the consequences of bringing a Joestar on a plane. Haha Mista just instakilled this unit, one of my favourite moments. 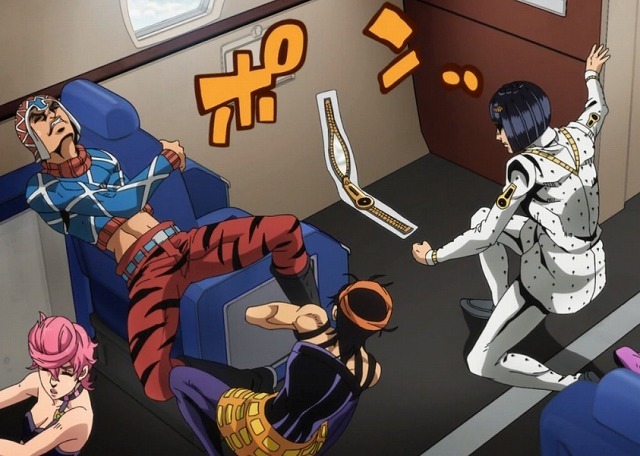 Mista doesn't play around, even if he is the Polnareff of this Part he is actually pretty quick on the uptake. >he is actually pretty quick on the uptake. This episode proved the exact opposite of that. 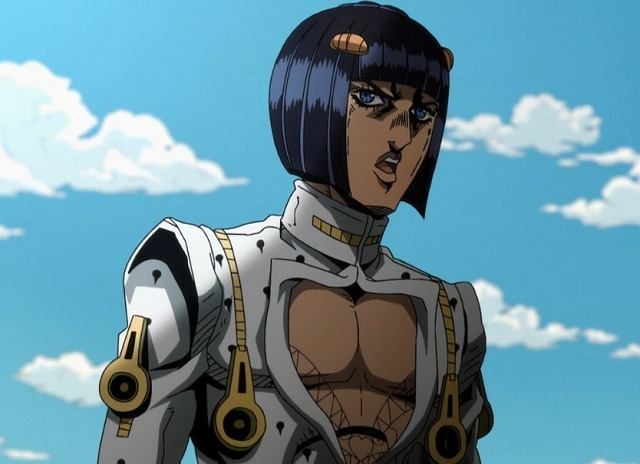 Why was he giving Giorno guff for the fridge? After all the crazy crap we've seen, his initial reaction is always bitchy, repetitive moaning. 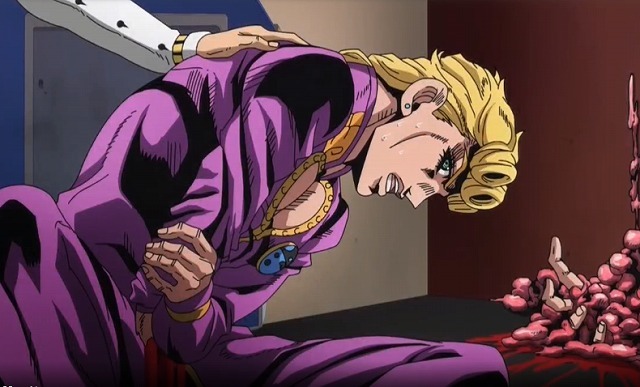 "GIORNO, HOW DARE YOU WASTE MY TIME WITH THIS FRIDGE! WITH THIS FRIDGE, MY TIME IS NOW WASTED, TO THE THIS FRIDGE!" Imagine having a Stand that requires you to die to use it. At least Stray Cat came back to life. How the hell did the boss even hire this guy? His neck was so thicc it fused with his skull and ribs. Dude looks like he came out of a horror movie. Creepy looking freak just approaches you out of nowhere, gets shot to death, and has this grotesque abomination chasing you. Dude looks like he came out of a horror movie. Judging by the way this episode went, it's more like the Gang accidentally stepped into one. 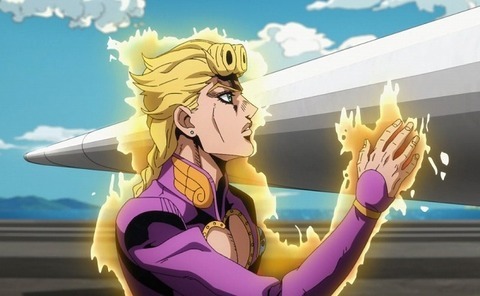 Has Giorno used that "detect life" ability before now? Well, I suppose he never had a need to. Giorno's Stand ability just works. 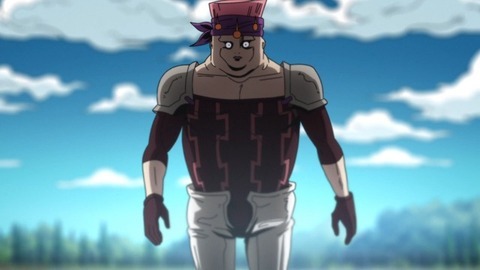 I'm unironically finding Gold Experience a lot more confusing than King Crimson, at this point. King Crimson's power is really very straightforward and consistent. Y'all remember when Gold Experience could make people's consciousness go berserk? Well, since the Black Sabbath fight,the last time he used it,he hasn't punched anyone. 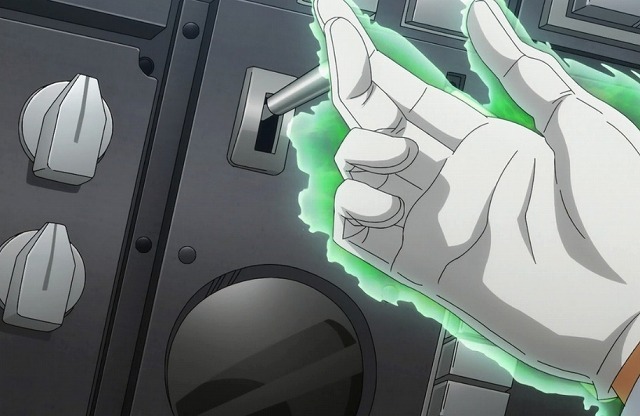 In White Album, he's punching an armor, and Baby Face avoided it. He actually looks menacing in the anime. In the manga he just looks extremely sad.